Description : There are two varieties of Colchicum. One is the sweet variety (Metha) and the other is bitter (Kadwa). Both varieties are analgesic, antirheumatic, astringent, cathartic and emetic. 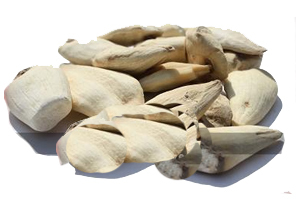 They are used to relieve the pain and inflammation of acute gout, arthritis and rheumatism. The bitter variety is poisonous and applied externally to reduce pain and swelling. The sweet variety is also useful in sexual debility. Recommended Dosage : Sweet Variety : 2 to 3 g powder; Bitter Variety : For external use only. Contraindication : The bitter variety is not to be ingested under any circumstances as it may cause death. Avoid the use of sweet variety in patients taking colchicine. Caution is also warranted in patients on cyclosporine, gemfibrozil, macrolide antibiotics, and St. John’s Wort. Care must be observed with old and weakend patients, as well as with those who suffer from heart, kidney or gastrointestinal conditions.The sweet variety is also contraindicated during pregnancy.